After another successful breakfast meeting with a partner contact, we had some unplanned free time due to rescheduling of a meeting. This allowed us a chance late morning to walk the Solutions Exchange floor to meet with Heraflux hardware and software alliance contacts. The additional free time worked out well, as it allowed us time to meet another new software alliance partner for Heraflux (and one of the Silver level sponsors for VMworld) that will be working with us on an upcoming whitepaper and webinar. Please continue to check heraflux.com/blog for details on the date for the webinar. This day also included another highly successful VMworld session, Performance Tuning and Monitoring for Virtualization Database Servers VIRT7511. David co-presented with Thomas LaRock, Head Geek from SolarWinds. I estimate the final attendance numbers for this session at over five hundred people. It really was a great session with outstanding information for anyone that attended. David and Tom answered many questions post-session, and then we met a partner contact at the VMvillage for a conference lunch. After lunch it was off to the casino floor to meet a customer contact at the VMworld Alumni Reception. It was great to meet this customer contact and discuss his company’s (both brick and mortar and on-line retailer) continued investments in VMware for their SQL Server environments. Side note, thank you to VMware for the very nice key chain and afternoon snack for the VMworld alumni that showed up for this event! The late afternoon concluded with us meeting a contact that works for a company headquartered in my home town of Chicago. Again, another contact that updated us on the system he supports, and his company’s use of SQL Server and VMware. After that meeting, I left David to return to the hotel to change into much more appropriate attire for an outdoor August evening in Las Vegas. David ended up heading to the Luxor to meet with some old friends for dinner. I went to the VMworld Customer Appreciation Party at the Las Vegas Motor Speedway. 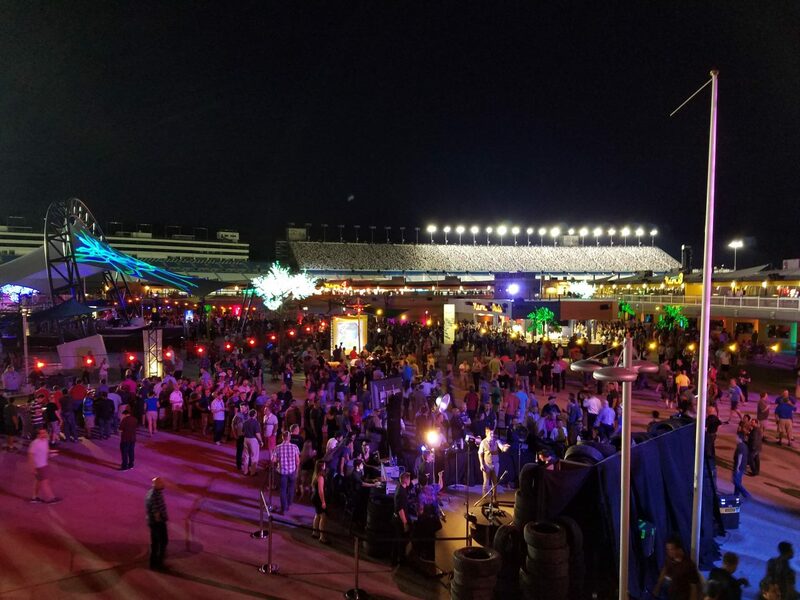 The event was incredible with all types of activities including pace cars, virtual racing, video games, and multiple food and drink stations. I stayed for 90 minutes, and unfortunately, did not get to see Fall Out Boy perform. Although the event was fun, it definitely was a hot weather evening in the desert – around 100 degrees Fahrenheit, and so I wanted to return to a location with some A/C. Great job to the VMworld event coordinators that planned this party! I returned from the Las Vegas Motor Speedway on a VMworld bus. After getting back to the hotel, we ended up putting the finishing touches on David’s presentation for his #vBrownBag Thursday session. 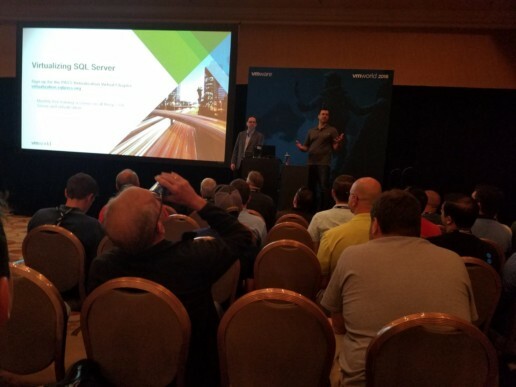 It was hard to believe the fifth day in Las Vegas at VMworld was complete, and we were preparing for the final day of the conference.